Dimensions (HxWxD): 1.75" x 1.15" x 0.85"
This lovely Large Bahia Blue-Green Obsidian Nugget from Bahia, Brazil, weighing 31 grams, or 1.1 ounce is a perfect meditation tool or medicine bag stone to hold, put in your pocket or on an altar or beside the bed to help you focus, relax, stay grounded & connected to your Higher Self. This natural specimen still has matrix attached which you can see in the photos on this page. Bahia Blue-Green Obsidian is a magical stone in appearance & lightens & deepens in color depending on the light in which it is viewed. It looks intensely blue-green and then quite translucent when it catches the light. Blue-green obsidian energizes and activates the throat and heart chakras, helping us to communicate our most heart-felt truth to others, especially in group settings, such as social media, performance, teaching, and writing. All those who work in mass media would benefit greatly from working with this stone. Obsidian is a glassy, vitreous mineral of volcanic origin, generally of black, brown, green or white coloration. Blue obsidian is more rare, and highly prized when it occurs in gem quality formations. Blue obsidian activates and energizes the throat chakra, and is used to develop clairvoyance and enhance the bearer's ability to channel messages from Spirit. Blue Obsidian is a deeply protective stone, enabling the bearer to sort through information & psychic impressions so that one feels an auric boundary shielding them from negative or detrimental influences. This beautiful, rare Blue Green Bahia Obsidian specimen imparts the soothing energy signature of the sea in gorgeous Bahia, Brazil. Jane and I feel a taste of that "peace that passeth understanding" when meditating with this Blue Green Obsidian, and we feel that there is a reason that so much obsidian has recently come onto the world markets -- because Lightworkers, meditators and healers definitely need the specific vibrations imparted by this remarkable stone. In meditation, Jane and I have found that Blue Obsidian helps relax the physical body, quiet the mind, and energize the heart chakra. 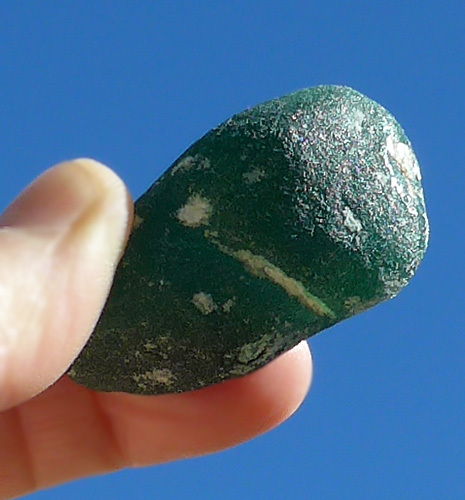 I was meditating with a Blue-Green Obsidian meditation stone, which is rough and uncut, and the size of a quail egg, when I started to feel all the tiny muscles around my eyes relax. Then the relaxation spread to my entire face, my shoulders, my arms and hands, down into my chest, trunk, and belly. Crystal healers recommend Blue Obsidian to all those who seek to remove unwanted energetic attachments from their auric fields. We all have a myriad of energetic attachments to other people -- our families, friends, co-workers, loved ones, and even those with whom we interact casually in our world, including in cyberspace! 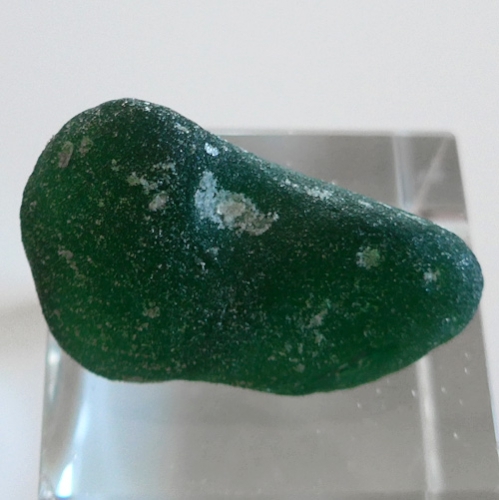 In fact crystal healers also recommend Green Obsidian to all those who seek to remove unwanted energetic attachments from their auric fields. 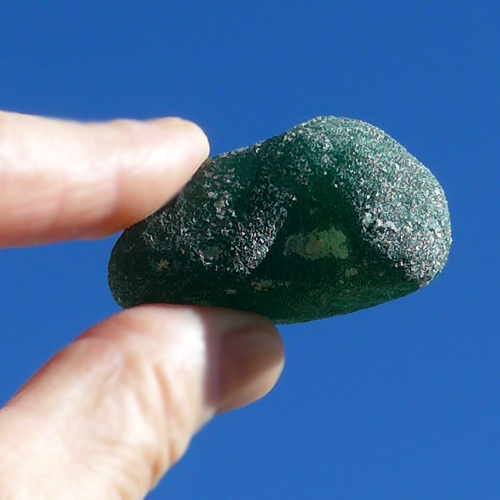 Green Obsidian is a stone of personal protection and physical relaxation, a heart-opening stone of truth-telling, a stone of deep meditation, and above all a stone that connects the bearer to the elementals, devas and nature-spirits of the place from which it originated. Weight above is shipping weight. Net Weight is 31 grams or 1.1 ounce.